From foundations to roofs, power plants to wind farms, roads to bridges—America’s infrastructure projects begin with mining. 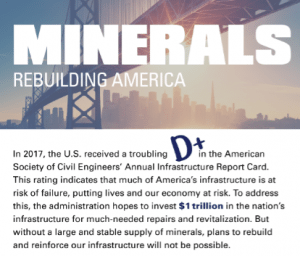 From foundations to roofs, power plants to wind farms, roads and bridges to communications grids and data storage centers—America’s infrastructure projects begin with mining. Consider that nearly every industry including energy, construction, transportation, and equipment manufacturing requires steel—a material dependent on both metallurgical coal and iron ore for its production. And copper’s flexibility, conformity, thermal and electric conductivity, and resistance to corrosion make it an ideal industrial metal. These are just a few of the ways that mining is contributing to America’s infrastructure.